The first time I saw a piece of Dansk Kobenstyle enamel cookware — while shopping at an antique mall – I was instantly drawn to the bright color and unique style of the handles. 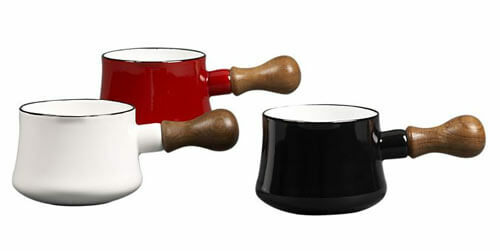 Then, a few weeks ago — I discovered that Dansk Kobenstyle enamel pots and cookware have been revived by Crate and Barrel. Dansk has not produced this cookware for more than 20 years — so it’s great to see this classic enamelware available again. Crate & Barrel will offer two exclusive colors. 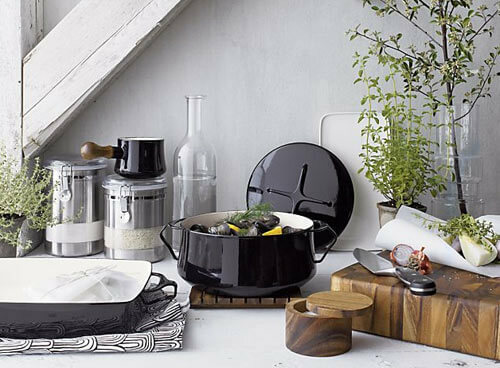 Kobenstyle, the Scandinavian enameled steel oven-to-table cookware designed for Dansk® by Jens Quistgaard in 1956, is now back and available at Crate and Barrel. A collectors’ item since going out of production more than 20 years ago, Kobenstyle is instantly recognizable for its high-gloss colors, welded cool-touch sculptural handles and inventive lids that double as trivets. 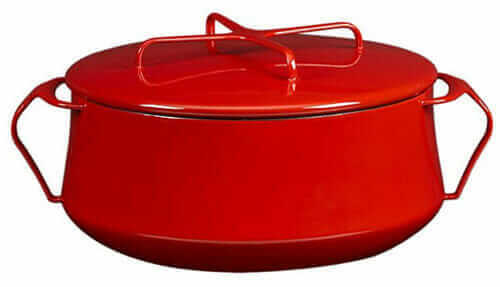 Casseroles, bakers and butter warmers crafted of lightweight enameled steel are available in white, black and a bold red exclusive to Crate and Barrel. Crate and Barrel thought it fitting that Kobenstyle should be reintroduced at the same time that we are celebrating our 50th year [the first Crate and Barrel store opened in Chicago In 1962] as we carried Kobenstyle for many years. Dansk stopped producing Kobenstyle over 20 years ago. Now, the Black and Red are our exclusive colors. Kobenstyle, truly one of a kind. A unique blend of exquisite design and superior performance. Moving effortlessly from stove to table, the casserole lid becomes a trivet, making a dramatic presentation. Every Kobenstyle design is easy to clean, offers enhanced heat conduction and the signature graceful stay-cool handles that are known and loved the world over. Originally designed in 1956 by Jens H. Quistgaard, one of the founding designers of Dansk, who helped define the Scandinavian Modern style. Kobenstyle is safe to use on all cook top ranges; gas, electric and induction. When cooking, apply heat gradually and always be sure there is some liquid, oil or butter in the ware. Using too high a heat may result in food sticking to the pot. Allowing the pot to boil dry will cause damage to the enamel. 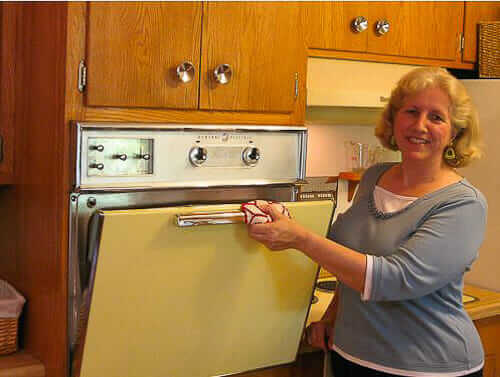 Do not heat over 450 F in the oven and use an oven mitt or glove when removing cookware. Only use wood, plastic or rubber utensils when cooking. Metal will scratch the enamel surface. For efficient cooking, use a burner that is similar in size to the cookware being used. Kobenstyle items with wooden handles are not oven safe and care should be used when cooking on the stovetop that the wood handle is not placed over the burner or come in contact with a flame. Kobenstyle is not oven to freezer to table safe. Kobenstyle cookware is not dishwasher safe. After the cookware has cooled use warm or hot soapy water to wash the surface. Rinse with warm water and dry thoroughly with a soft absorbent cloth. Never use steel wool, scouring pads, oven cleaner or abrasive cleaners to clean the cookware. This will damage the enamel surface. If food becomes stuck, fill pot with hot soapy water for an hour. 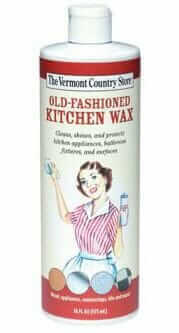 Then use warm or hot soapy water to clean, rinse and then thoroughly dry. Never place in cold water when the cookware is hot or pour hot water into the cookware when cold. The rapid expansion or contraction could damage the enamel. If the enamel does get discolored, use household vinegar in warm water to clean (one teaspoon of vinegar to one pint of water). Soak for 1 to 2 hours, then clean normally with warm soapy water, rinse and then dry thoroughly. A teak and stainless steel design for a fork and knife which Quistgaard had designed and forged by hand were put on display in 1954 at a museum in Copenhagen, which he had created because he couldn’t find anything available for sale that he liked enough to purchase. American Ted Nierenberg was on a tour of Europe and spotted the flatware when he visited the museum. Nierenberg tracked down Quistgaard and convinced him that the design could be mass produced, leading to the creation of Dansk International Designs. From the mid-1950s until the 1980s, Quistgaard created designs for Dansk from his studio in Copenhagen. In 1956, Quistgaard designed the Kobenstyle cookware line of enameled cookware, which were both functional and visually attractive, able to be brought from the kitchen to the table, with the lid serving as its own trivet. 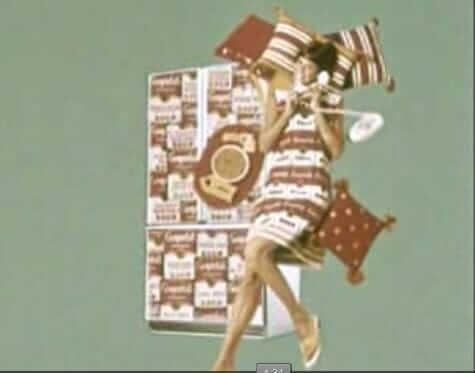 By 1958, Nierengard and Quistgaard had expanded Dansk’s wares to include teak magazine racks and stools, stoneware casseroles and salt and pepper shakers, and flatware with split cane handles, with The New York Times that year as “creating a stir” as “some of the most popular accessories found in American homes. 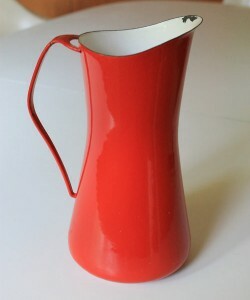 Kate’s vintage Danks Kobenstyle red pitcher. Vintage Kobenstyle pieces come in yellow, red, blue, turquoise, orange, black, chocolate brown, almond, white, kelly green and hunter green – all of which have white enamel insides. 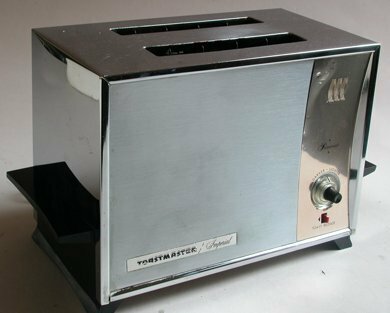 From what I can find online, there were nine different styles of vintage Kobeystyle pieces: lidded casserole dish in two sizes, paella pan, butter warmer, stockpot, frying pan, fondue pot, rectangular baking pan, pitcher, and coffee pot. To my surprise, I realized that I had a Kobenstyle pitcher in my collection of colorful vintage enamelware pieces. I could tell not only by the shape of the pitcher and distinctive handle (though I think the handle on my pitcher was originally wrapped in some sort of plastic cord, which was not present when I bought it), but also from the stamp on the bottom of the pitcher which reads “Dansk Designs France IHQ” – the mark of Jens Quistgaard. Eager to see more pictures of vintage Dansk Kobenstyle enamelware? Check out the Kobenstyle Flickr pool. Do you own any vintage or new Kobenstyle? Is it for display or part of your daily cooking utensils? I own a yellow blue smaller baking dish and a butter warmer in red.now I ordered 3 pcs from lennox on line. I think the baling dish will be larger than the ones I own so please help me find a smaller on in red thank you. ebay and etsy.com — you need to stalk those places for vintage, I recommend. I found a vintage percolator coffee pot but it is missing the glass piece in the top. Any ideas where I might find one? i wonder if the new ones are as good as the vintage ones – ? the vintage kobenstyle were made in denmark and france, i believe. the new ones have of course been outsourced to asia (thailand). I have 2 pitchers, large and small, both turquoise with the wrapped handles. They’re in excellent condition. Dansk pot for cooking? Mine is an original; chipped on the inside bottom. Suzanne, we don’t give advice like this. I suggest: Contact Dansk and ask them.